Our pets love when review items come in for them to try. Some are loved by all and some are loved by some. This one although made of beef, my cats loved, while it took our Saint Bernard a while to warm up to. She would rather a bone or left over meat from dinner then these snacks, but like I said our cats love them. Our cats will come running as soon as they hear the bag, they know the sound and want to be the first one by my side to receive at treat. I like how I can either give a whole stick to our dog which is a giant breed dog, or break them into tiny pieces for my kitties. You can find these Jerky Treats on Amazon. What Mano & Mano has to say about their product. 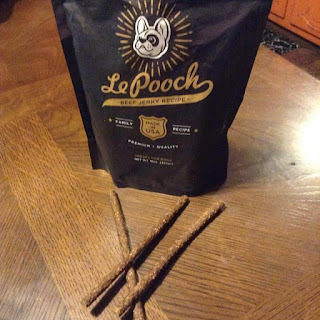 LE POOCH = LE LOVE - These premium, 100% American-made beef jerky treats are so delicious, your pooch will simply want more! Slow cooked to perfection, our healthy Le Pooch treats will have tails wagging and mouths watering. 100% SAFE AND HEALTHY - No nasty foreign ingredients are added to our treats, only the finest premium quality American beef, free from soy, wheat, gluten and corn fillers - so you can feel safe knowing exactly what you are feeding your pup! TREATS FOR PERFECT TRAINING - Encouraging your Pooch to obey your training techniques will be easy when using Le Pooch treats as a reward. Watch how your furry friend will want to impress you for another one of these easily breakable treats! Disclosure: MarksvilleandMe received one or more of the products mentioned above as part of a promotion with Tomoson and Mano & Mano. Regardless, MarksvilleandMe only recommends products or services we use personally and believe will be good for our readers. Some of the links in the article may be “affiliate links.” This means if you click on the link and purchase the item, I will receive compensation. If you would like MarksvilleandMe to review a product or service please contact us at marksvilleandme@gmail.com.